First off I would like to apologize for the inconsistent posting schedule of the past two weeks. Things have been a bit hectic since college has ended and we have moved back home for summer break. Whenever people hear that I review pens on this blog the first question I get is, "Are you serious, why?" the second question is "What's your favorite pen?". For me my top 3 is always changing. Sometimes I hate a pen when I first use it, then a month later I try it and love it. Sometimes I use a pen for months and love it like a child, but then it falls out of favor. So this is not a static list of pens that I enjoy but an ever changing list that will be updated in the future. 1. Pentel EnerGel .5mm Black "European version"
The review of this pen was written by Cody. He gave it a 10. If I wrote the review I would have also given it a 10. This pen is my go to pen for long writing sessions or quick notes. It does everything well, and does not have any flaws in my opinion. It is the bees knees. The European version gets my vote because of the removable cap. I dislike retractable pens. 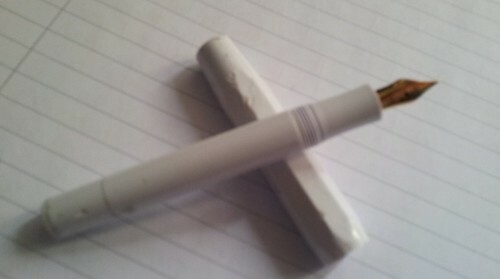 This pen is a living legend, a classic. We haven't reviewed it yet on #penswag, but keep an eye out for it next week. This pen has been on my list of favorites since I was in grade school. It doesn't matter if it is in the .7mm or .5mm version I love it. The simple design of the pen, the window to view ink level, the smooth rolling ball that deliver the ink. Everything is great. Also, the cap is removable another bonus, I'm not a big fan of retractable pens. When I first got this pen I hated it. When I reviewed it I gave it an 8. The only reason it got an 8 was because of the smallness of the body. If the body was just a bit bigger this would be one hell of a power house. Despite the small body I still find myself reaching for this pen over and over. I love writing with it and that's undeniable. It is a great pen, and it can take a beating. So there it is. My three favorite pens as of right now. Agree, Disagree, have your own list of favorites? Let us know. LOL I love the reaction you get "Are you serious, why?" I totally get that too. People are like "You do what? Why?" I was super curious to see what your picks would be. I've been wondering myself how I would narrow it down. I'd need a top ten I think... I could never narrow it down to top three although it would be really interesting to try. I LOVE the Euro Pentel EnerGel too!! That thing is awesome, and the V5s are classic. I still have several of the older style ones that I treasure. They've never dried up and never ever give me problems writing. A Kaweco sport is on my wish list so I can't attest to that one...yet. Heehee! Yea it was super hard narrowing it down, and the difference between 3rd and 4th place is so slim. The V5 had to be on here though, it's been one of my favorite pens since I was in 4th grade. The Kaweco is growing on me more and more as I use it, a great purchase if and when you get it.